These Nammor Glass Mouthpieces are hand made and designed to work specifically with the Nammor hookah hose. 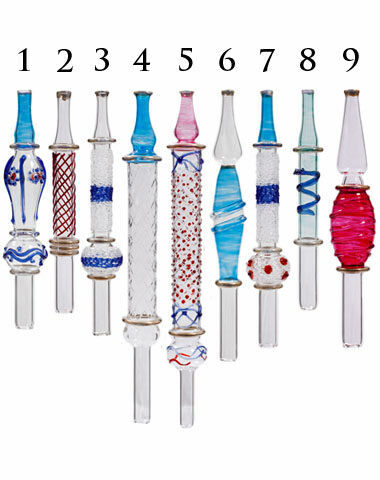 Available in 9 different styles, ranging in length from 4 to 10 inches, these colorful and stylish glass mouth tips are the perfect way to personalize your hookah and show off your own personal style. To use these glass hookah mouthpieces simply remove the existing plastic mouth piece from your Nammor hose and replace it with your new glass mouthpiece. Be sure to use the included rubber gasket to ensure an air tight seal. Glass Nammor Hookah Hose Mouthpiece has a average rating of 5 stars out of 5 stars based on 1 reviews. A: Yes, these fit on Nammor hoses, so the hookah is inconsequential to the functionality.